Latest acquisition is going "Home" to the Bretscher household in Rockville Center, Long Island. This is the 1961 version of the original 1933 edition of Courtland Smith’s perennially popular map. Pictorial map of Long Island, from Brooklyn and Queens to the Hamptons and Montauk. Landmarks such as Montauk Lighthouse, the beach at Southampton, and the Fire Island Light are shown. 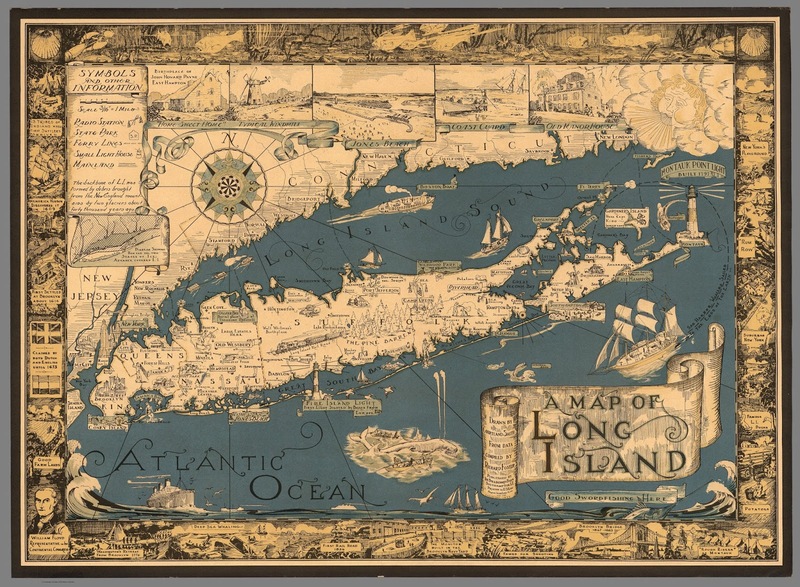 The Atlantic Ocean and Long Island Sound are decorated with various pictorial illustrations including a striped bass, swordfish, spouting whale, and the Sag Harbor Whaler ship. Other decorations include an Art Deco wind figure and compass rose. An intricate border is decorated at the top with underwater scenes; on the sides with famous sites such as Birthplace of John Howard Payne, East Hampton, and Jones Beach; and with historical events, such as the settlement of Brooklyn and building of Brooklyn Bridge. The key indicates radio stations, state parks, ferry lines, small light houses, and mainland.